This five strand necklace of stacked flat nuggets shows Irene's discerning eye for the finest materials. 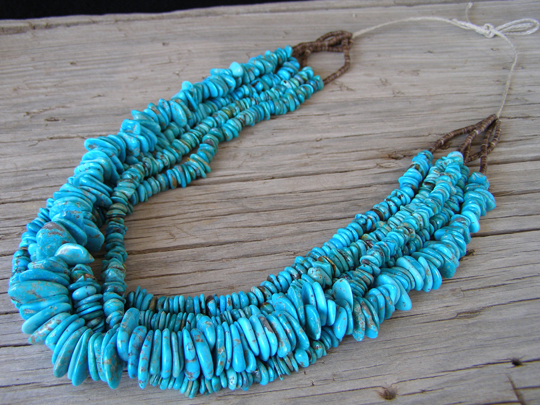 Precious little fine Kingman turquoise makes it through the pipeline these days for such necklaces. This stone exhibits superior coloration and beautiful polish. Irene preps her own materials, which means that she tumbles her own nuggets in a rock polisher and hand drills them for her necklaces. This has one strand which holds larger, heavier nuggets than the other four strands. If you don't already have a necklace by Irene, you'll marvel at how her fashion of stringing lends a particular silky movement to the strands and makes them more comfortable and attractive to wear. She is a master, but the proof is in the pudding and you have to take the step. Her necklace finishes with braided strands which can be tied off as one wishes. This gives some increased ability to determine the length and makes for a comfortable arrangement at the collar line in back.